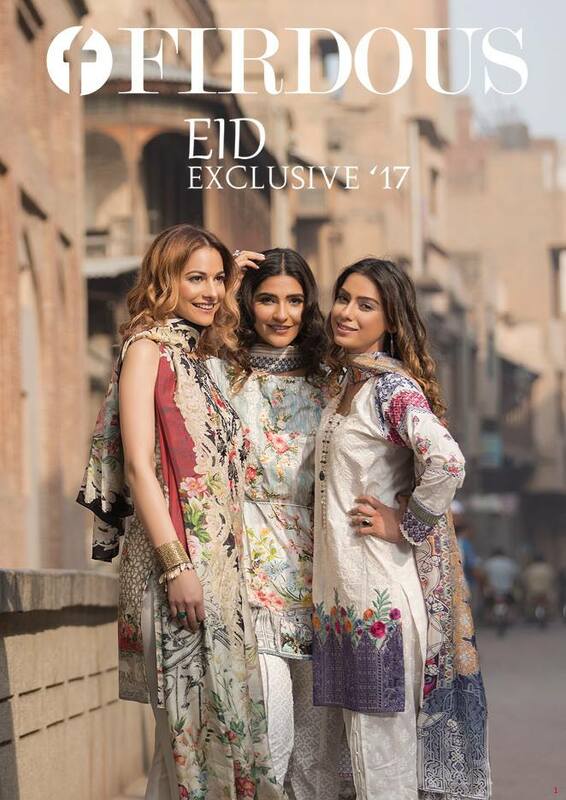 26th May 2017, is the day you all should mark on your calendars, as Pakistan’s most eminent clothing line Firdous textile is bringing you the best of its Exclusive Eid Collection ’17 on the big day. The line is famous for the quality fabrics it produces and the quintessential prints or embroideries it crafts to meet the ever rising standards of textile market. 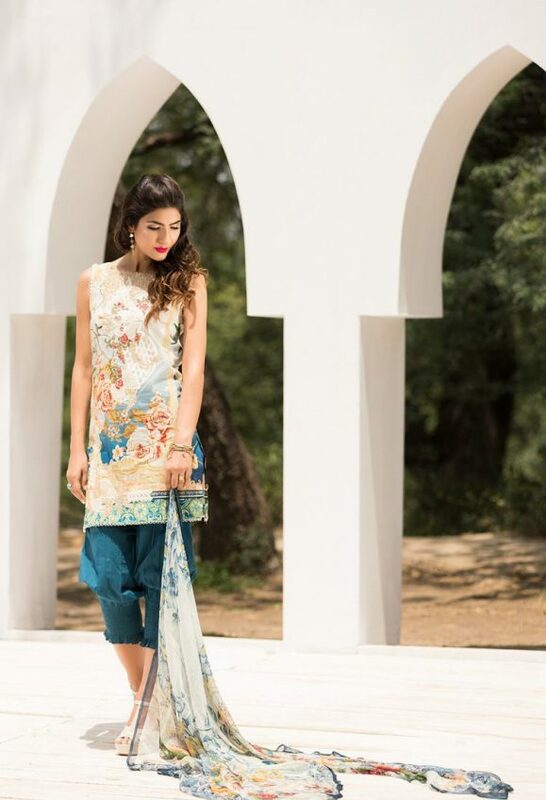 Break the heat of scorching summer with cool and refreshing designs by Firdous. 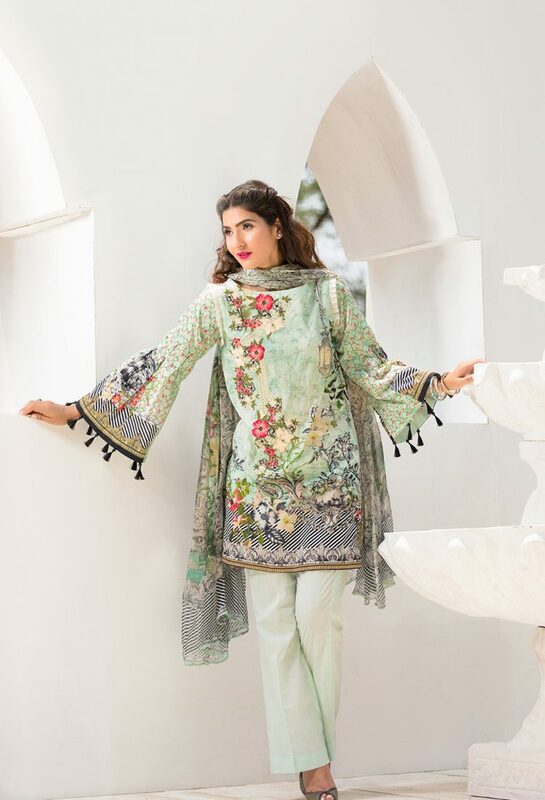 Firdous Lawn Eid Exclusive Dresses Collection 2017 looks extremely distinctive because of unique lace embroideries, necklines cuts and designs, sleeve patterns and chiffon dupattas. Imagine all this, in affordable prices ranging from Rs 4850 to Rs 6790, depending on the richness of the embroideries and details of the mesmerizing digital prints. The dress is embodying pure grace with its delightful digital print over the shirt. It has organza neckline with pretty lace. The trouser is dyed in teal to spark the contrast between the shirt and bottom. 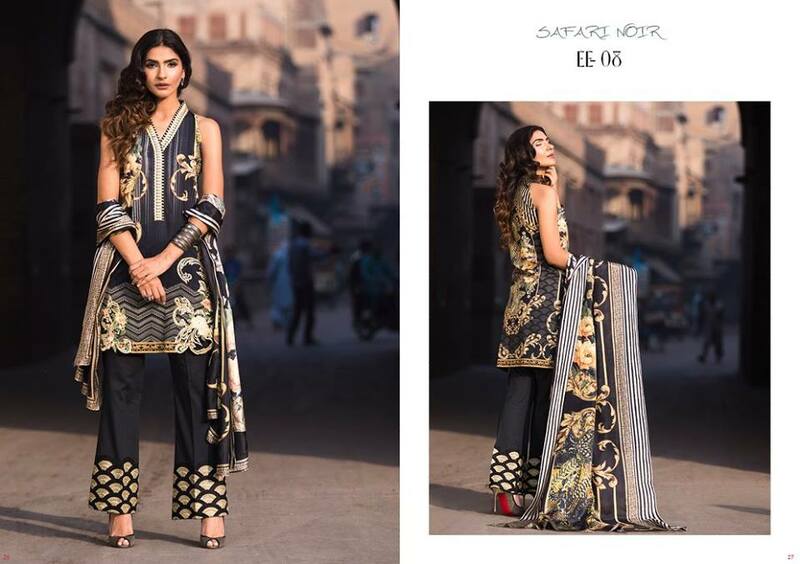 Its chiffon dupatta is also printed digitally with fascination floral prints. 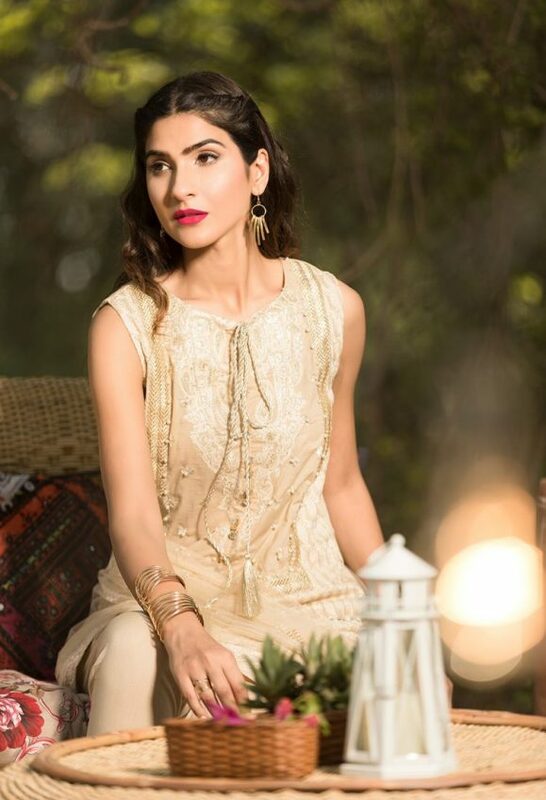 Soft calming hues of the dress will cool off the heat of this blazing summer and will give a perfect attire for Eid. Another refreshing combination of soft hues in blue, indigo and cream, this dress is oozing with refreshing digital prints. Shirt is encompassing both the prints and embroideries while keeping a tasteful balance between the two. 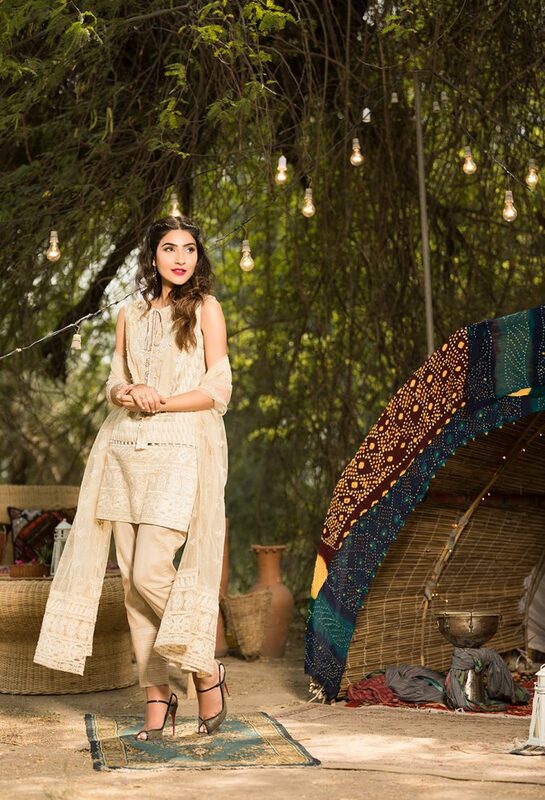 Its lovely white trouser is given with an embroidered lace. Dupatta is however is simple and light with loads of appealing digital prints. This dress is a creative use of teal with yellow. The contrast is further adorned with mesmerizing digital prints. The neckline of shirt is embroidered using intricate designs. The sleeves of the shirt are also embroidered with decent motifs. Trouser on the other hand is also designed with an added lace. All of this is paired with alluring chiffon dupatta with the shades of teal, blue, peach and others. Portraying a lovely landscape with a sunset, the line has designed a masterpiece using various shades of yellow and mustard. The shirt embroidered with pretty work around the neckline. It is printed digitally to capture the appealing sight of a sunset. Sleeves are also embroidered here with side motifs. Dupatta is uniquely designed using Tissue silk, printed digitally. Taking you to the land of pure serenity, this dress is epitome of elegance. It has lovely Jacquard shirt which is embellished with delicate embroideries. Sleeves are simply designed with digital prints. Border and neckline of the shirt is given with pretty laces. Dupatta is silk looks ravishing with all those prints. Bottom is simply dyed in soft shade of teal. Light minty fresh green, is everything we need in summers to cheer us up. Hence this dress is a must to try this summers. It has pretty printed shirt with varying designs and floral patterns. The print is highlighting the contrast up to the fullest. 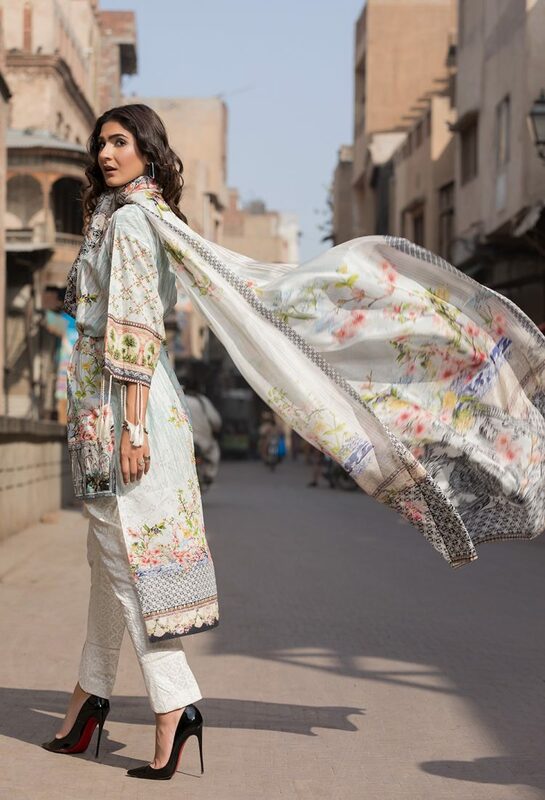 Dupatta in chiffon is complementing its richly printed shirt. 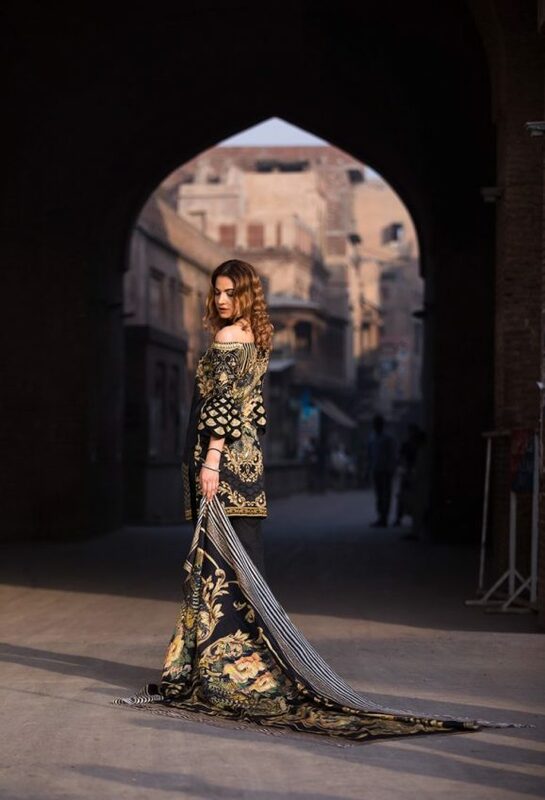 A rich classic black dress with doze of prints and embroideries in gold, is what you to flaunt your style. The shirt is a unique mixture of prominent swirling patterns with lace for neckline and border. Trouser is also embellished with lace wok. 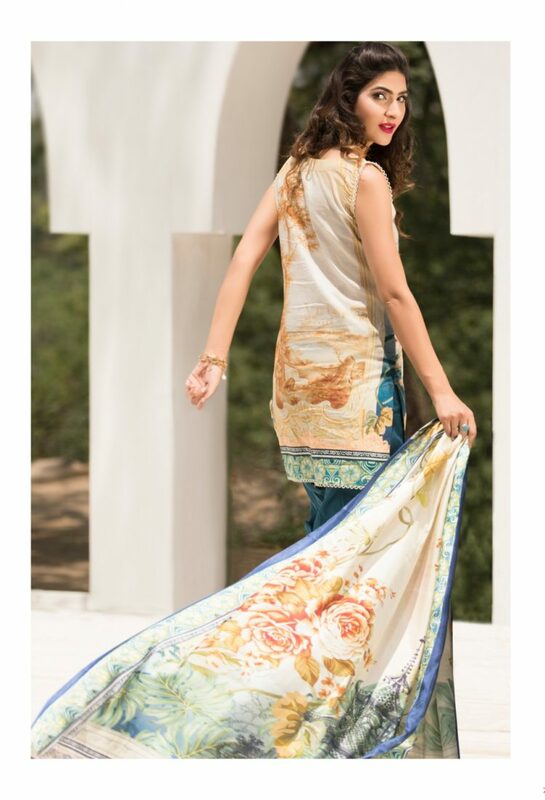 Its dupatta in silk is printed with distinctive patterns. Safari Noir is designed to complement the charms of strong and independent women. Island high is rich dose of embroideries. From the front of the shirt to sleeves and borders, everything is intricately embroidered using shades of pink and purple. However the back of the shirt is printed. Trouser has its own self print in white. Neckline embroidered with thread work in black is the most distinctive feature of the dress. These contrasted with the mild floral patterns in pasty red. The overall ensemble is a perfect combination of hues with an alluring set of digital print. Dupatta is silk is also heavily printed with nice and decent floral patterns. A mild boost of blue, is bringing life to this dress. It is complemented with detailed prints and intricate embroideries. It has pretty white trouser with a charming self-print. Dupatta in tissue silk, looks ravishing. This dress is perfect option for women of young ages. No couture is complete without a little dose of pink. This pretty pink is what you need this summer to flaunt your beauty in the most elegant manner. It has fused with breath taking digital prints in pink and magenta. The neckline is intricately embellished with embroideries. 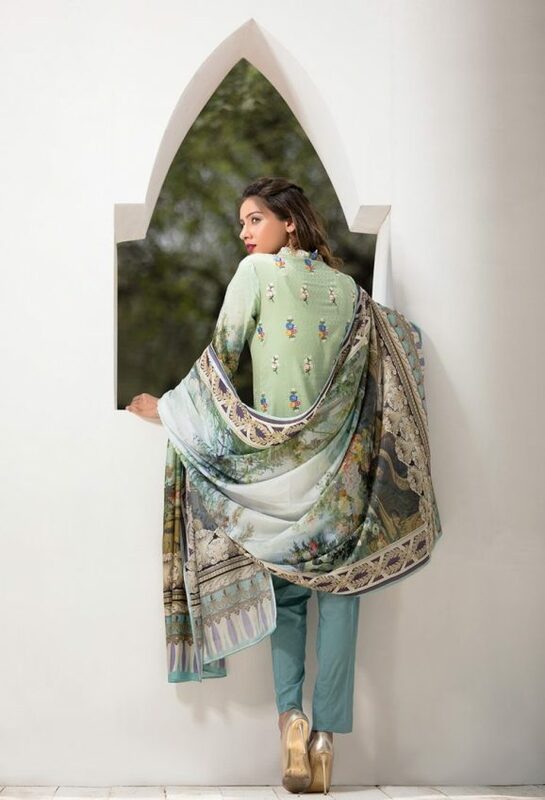 Dupatta in pure chiffon is printed with complementary digital prints. It seems like the skies are captured into a single sight. This dress has such a calming effect due to its soft blue coupled with prints in mustard and purple. Printed shirt is bordered with embroideries whereas the sleeves are embellished with motifs. Fusing traditional and modern all together, Lucknow presents you the best of the rich Indian culture. The front of the shirt is embroidered richly with the monochromatic embroideries, complementing the work over its sleeves. Border of the shirt is also heavily embroidered along with the dupatta, which has elegant net embroideries. 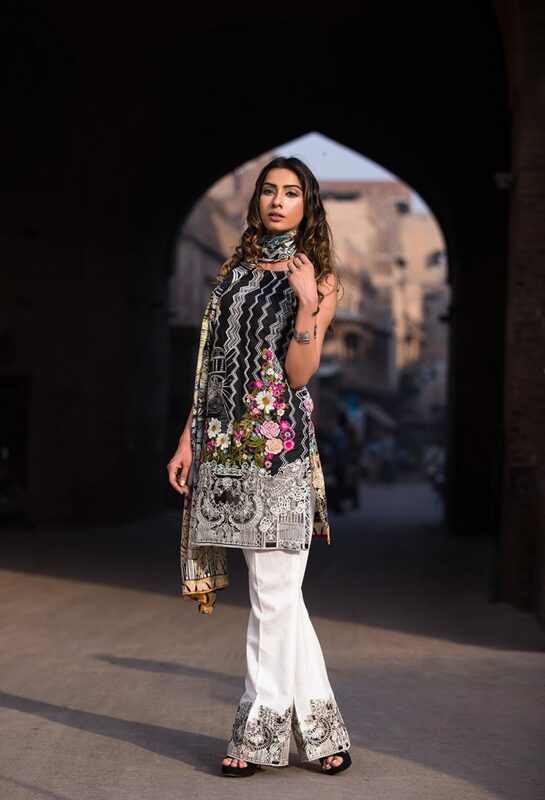 Another black from the firdous exclusive collection is paired with white to balance out the alluring design. 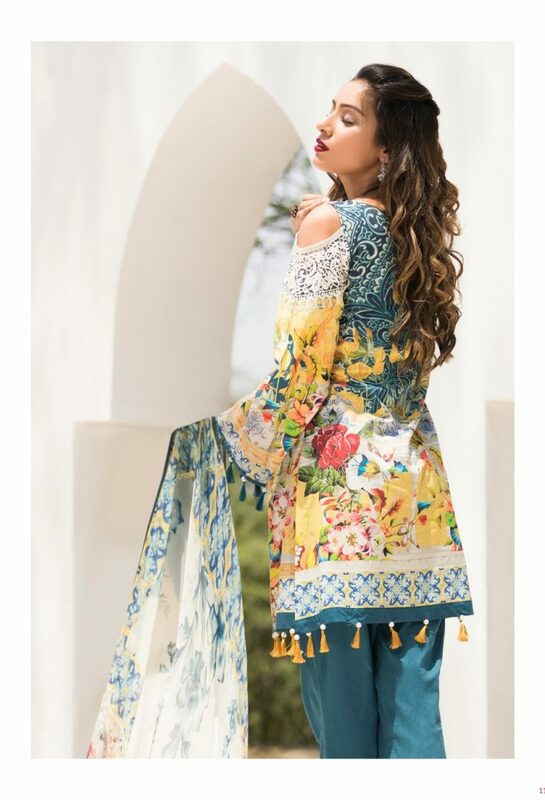 It has embroidered front and border, printed sleeves, silk dupatta and jacquard trouser.